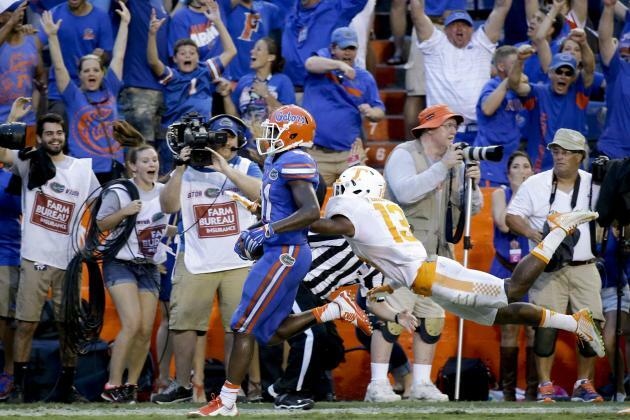 Tennessee lost a heartbreaker to Florida this past Saturday. They shall continue to lost more close games until they learn how to close, so to speak. 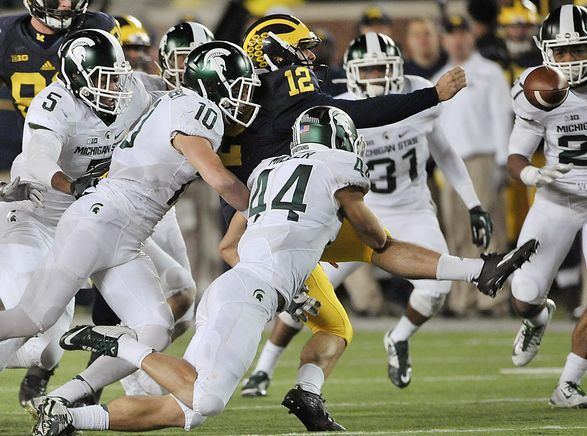 Photo by John Raoux of the AP. Tennessee lost a heartbreaker on the road to Florida, thus continuing a losing streak to the Gators that started in 2005. Earlier in the season, they lost another heartbreaker at home to Oklahoma. What is so heartbreaking about both of these losses is that the Volunteers were in the lead for most of the game, until blowing the lead late in both games. Butch Jones is continuing to improve the program, gradually bringing it back to its blueblood status in the conference. But they’re clearly not there yet, and shall not be “there” until they learn to “close the deal,” which is to say, they must learn to finish the games strongly. It is still early in the season, so still time to salvage things. Speaking of salvaging, Steve Spurrier seemed to have salvaged things reasonably well when his team beat a deceptively good Central Florida squad. Next week, though, they travel to a Columbia, Mo., to take on a similarly-ailing Missouri Tigers team, in what one can easily surmise is a must-win game for both. Why are both aforementioned teams ailing? They both lost to Kentucky, for goodness sake! Speaking of UK, given that the Wildcats have W’s over both the Gamecocks and the (Mizzou) Tigers, and they face a relative cupcake in the EKU Colonels this Saturday at home (a quasi-body bag game), the possibility that they could become bowl-eligible in the brutal SEC is not a remote one. Granted, they face a brutal stretch after the EKU game, facing, in order, Auburn, Mississippi State, Tennessee, then Georgia, but then have a two-week respite with Vanderbilt and then a gimme with Charlotte before concluding the season against improving Louisville. It could be a 6-6 year, which, for UK, is an improvement. Utah and Michigan started the season playing each other. Though the former beat the latter convincingly, both teams are rolling right now. Funny how that works out. TCU beat Texas Tech in a high-scoring game that went down to the wire. The Horned Frogs are supposed to be a top-five team, so how does one account for this narrow victory in a shootout? Let us not forget that this TCU team also squeaked by Minnesota at the beginning of the season. Are the Frogs overrated? The upcoming home game against a gradually-improving Texas team could be a referendum. The only regretful thing about this delightfully intriguing matchup between Notre Dame and Clemson is that Brent Musburger will not be calling the game! Two really good games followed each other consecutively in South Carolina @ Georgia followed by Notre Dame @ Michigan. In the case of the former, the Gamecocks’ season is not lost by losing to a tough Bulldogs squad who had their collective backs against the wall after blowing the season opener on the road to perhaps the best Clemson team that school’s history. Conversely, had Georgia lost two games in a row to start off their season, no matter if they won out for the remaining weeks, the season, by team’s and fans’ standard would have been clearly lost. In the case of the latter, some degree of poetic justice was achieved in the Wolverine’s victory over the Fighting Irish. It is understandable why Notre Dame saw fit not to renew the rivalry on their schedule, what with trying to broaden their geographic outreach into the recruiting hotbeds, which, to remind certain fanbases, are NOT in the Midwest anymore (Ohio notwithstanding, to an extent, but Ohio State owns that anyhow, and should). But that does not obfuscate the other understandable situation where the Michigan fanbase feels snubbed by a team that still acts as though it is “above it all.” Did I say “poetic justice”? How about vindication? Meanwhile, going forward, it is worth pointing out that when it comes to the prognostications for the upcoming week, the two most difficult things to predict are the offensive explosion and the defensive struggle. The Michigan-Notre Dame game certainly did not live up to the latter billing (41-30); neither did the West Virginia-Oklahoma game (16-7). One should have reversed those two games into opposite categories, and then we would have had something (in 20-20 hindsight, at least)! Oh, and the latest news has it that Texas’ defensive coordinator Manny Diaz has taken the fall for the Longhorns’ ignominious loss to unranked BYU. The Horns gave up a school record 550 rushing yards on defense. This means that even though Texas had some very bad teams in the 1980s and some of the 1990s, even they did not give up that much yardage on the ground in a game. Something obviously had to be done. Mack Brown has appointed Greg Robinson (former Syracuse head coach – one of those guys who is better as a vice president than as a chief executive) as the new defensive coordinator, a role that he actually already served in for the team in 2004 (that same team that came back to beat Michigan in the Rose Bowl). On paper, it is a good hire; time will tell if what is on paper will manifest in reality. But regardless, it’s still a step up from the inept display the Longhorn Nation had to endure yesterday.